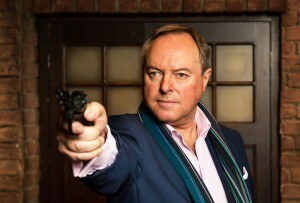 ROBERT DAWS and Amy Robbins are married in real-life, played a married couple in ITV medical drama The Royal and are now playing a couple again – on stage in Rehearsal For Murder. The pair met on Robert’s first day on the set of The Royal and romance blossomed very quickly. Now married for 13 years, they were both pleased to be offered their roles in thriller Rehearsal For Murder. “It’s nice that we can do this together because usually, if one of us is away filming or on tour, it means great stretches away from the family – so we thought this would be nice,” says Amy. “There’s a line in the play about theatre being a different animal and, it really is. One disadvantage of both Amy and Robert appearing in the play is that they will both be away from their children at the same time, but Robert says: “The kids are looking forward to it! We had to make a decision to say the time is right. Robert and Amy will star alongside Robert Duncan, Susan Penhaligon, Steven Pinder, Lucy Dixon and Ben Nealon in A Rehearsal For Murder at the Yvonne Arnaud Theatre, Guildford, from Monday 11 April until Saturday 16 April.